Fat catches a lot of criticism for being a dietary no-no, when in fact it is an essential macronutrient that your body cannot live without. While too much fat, especially the wrong kinds, can cause weight gain and health problems, too little can also pose risks. Women often avoid fat when dieting because they think it will hinder their weight-loss efforts. Understanding how much fat is actually recommended for your diet will help you eat smarter and manage your health. The Institute of Medicine recommends all adults consume between 20 and 35 percent of daily calories from fats. The American Heart Association recommends a slightly narrower range of 25 to 35 percent of calories daily to come from fat. The average number of calories recommended for adult women is 2,000 calories per day, so a woman should consume between 44 grams and 78 grams of fat pet day according to the IOM or between 55 grams and 78 grams according to the AHA. Women need dietary fat to help with vitamin absorption, energy production and hormone regulation. Too little fat may disrupt a woman’s menstrual cycle and fertility. Certain types of fat, called omega-3 fatty acids, promote heart health and brain function. You can only get omega-3 fatty acids from your diet, specifically fatty fish, flaxseed and walnuts. When aiming for your recommended fat grams, focus on unsaturated fats. These fats, found in plant oils, nuts, avocados, salmon and seeds, can promote heart health by lowering your levels of bad cholesterol. 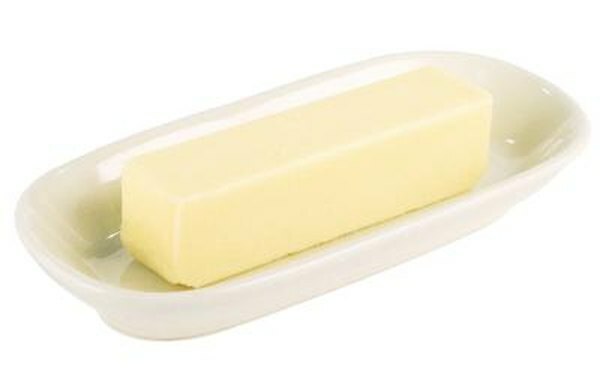 Saturated fats are those found in meat, butter, some processed foods and tropical oils. Saturated fats can clog your arteries and raise cholesterol levels, so the American Heart Association recommends keeping your intake of this fat to no more than 7 percent of daily calories, or just 15 grams for a 2,000-calorie diet. Trans fats are man-made fats found in commercially fried foods and some processed snacks. This fat can increase both your total cholesterol levels and your bad cholesterol levels. The American Heart Association and the Institute of Health both recommend avoiding this fat altogether. A 2,000-calorie meal plan for a woman with 58 grams of fat, or 25 percent, begins with a serving of shredded wheat, 1 cup of skim milk, a medium banana and 1 ounce of chopped almonds. For lunch, have a serving of woven wheat crackers with a salad made with romaine lettuce, 1 cup steamed green beans, 1 cup boiled white potato, 4 ounces of water-packed tuna and a dressing of ½ tablespoon olive oil mixed with lemon juice. At dinner, mix 1 cup cooked whole-wheat pasta with a serving of marinara sauce, 1 ounce part-skim mozzarella cheese, 2 ounce lean ground turkey and 1 cup steamed broccoli. For snacks, have a cup of nonfat plain yogurt with 1 tablespoon chopped walnuts and 1 cup blueberries and a slice of rye bread with 1 tablespoon light cream cheese, 2 ounces of smoked salmon and sliced tomatoes. Ask the Dietitian; Low Fat Food Tips; Joanne Larsen, M.S., R.D.